All countries with a high level of scientific potential "are actively developing hypersonic weapons," Putin said, adding that "Russia already possesses such weapons"
MOSCOW, March 1. /TASS/. Russian President Vladimir Putin announced on Thursday that Russia possesses hypersonic weapons. All countries with a high level of scientific potential "are actively developing hypersonic weapons," Putin said in his State of the Nation Address to the Federal Assembly. "Russia already possesses such weapons," the president said. Therefore, the world’s leading armies want to possess these ideal weapons, he added. Russia has created modern, compact and hi-tech Armed Forces, he said. "We can say with full validation that Russia has created modern Armed Forces, which are compact and hi-tech troops for this huge territory, with an officer corps as its heart, where every officer is ready for any sacrifice for its nation," he said. Putin is certain demonstrating the capabilities of Russia’s armed forces will bring any belligerent back to reality. "I hope that everything that was said today will bring any potential aggressor down to earth," the head of state said. The president stressed every system, presented during the address, is unique and important. "Even more important is the fact that together they all allow the Defense Ministry and the General Staff to create the promising multifaceted system for the country’s defense, where every modern instrument plays a role," Putin said. Russian designers and scientists, who have been working for years to create Russia’s newest strategic weapons, are true Heroes of Our Time, the president said. "Quietly, humbly, without any self-admiration, with full sacrifice, thousands, literally thousands of our specialists - outstanding scientists, designers, engineers, and talented committed employees have been working on it," he said. "Many of them are young people," he continued. "They all, like our military, who demonstrate in combat missions the best qualities of the Russian Armed Forces, are the very Heroes of Our Time." "By the way, code names for these new two types of Russia’s strategic weapons, which are a cruise global-range missile and unmanned underwater vehicle, have not been chosen yet," Putin said in his State of the Nation Address to the Federal Assembly on Thursday. "We expect proposals [to be posted] on the Defense Ministry’s website." The Kinzhal hypersonic complex capable of delivering missiles to a discharge point within just several minutes assumed combat duty in south Russia on December 1, 2017, Putin said. "As an important stage of armament development, a precision hypersonic aviation and missile complex has been created," Putin said. 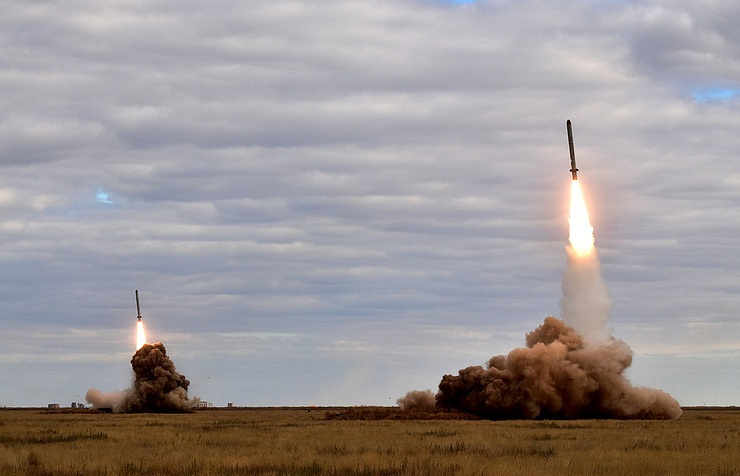 From December 1, 2017, the new missile complex called Kinzhal "started carrying out its experimental and combat duty missions at aerodromes of the Southern Military District," the Russian president said. According to Putin, "the unique flight and technical characteristics of the high-speed aircraft-type carrier make it possible to deliver missiles to a discharge point within just minutes." Russia constructed an unmanned submersible vehicle capable of covering unlimited distances at extreme depths, Putin said. "It is a well-known fact that unmanned weapon systems are designed and produced around the globe," Putin stated. "I can say that Russia has designed unmanned submersible vehicles capable of operating at extreme depths." "I would say that it is capable of operating at very extreme depths covering intercontinental distances at the speed, which greatly exceeds the speed of all submarines, up-to-date torpedoes and all types of high-speed surface ships," the Russian president added. Putin said that such unmanned vehicles have a low noise level, are highly maneuverable and almost invincible to an enemy. "Technical means, which can stand against them, simply do not exist in the world today," Putin stated adding that the new weapon is "simply fantastic." Putin noted that the years-long testing cycle of an innovative nuclear charge, specifically designed for the new unmanned submersible vehicle, had been completed in December 2017. The nuclear installation, he continued, is compact yet highly energy efficient and being hundred times smaller in size than the analogues on board of modern submarines. It has enormous power and requires 200 times less time to be put on combat alert. "The results of the tests granted us an opportunity to begin producing a completely new type of strategic weapons armed with nuclear warheads of enormous power," Putin added. The new military systems using new physical principles, including laser systems, multiply Russia’s opportunities in the defense sector, the president said. "We are well aware of the fact that some counties have been working on new weapons based on new physical principles," he said. "We have reasons to believe here we are one step ahead of them. At least, where it is needed most." "For example, we have great results in creating laser weapons, and we are speaking not about theories or projects, nor about beginning production," he continued. "First laser systems have been supplied to the Armed Forces since last year." "I would not want to go into details here - it is not the time yet, but specialists would understands that having such military systems multiplies Russia’s abilities in the defense sphere," Putin said. "Of course, we will continue to engage in finalizing, developing and updating our weapon inventory. And of course, I have mentioned far from all our achievements and advanced development, but it’s enough for today," Putin said. I want to specifically emphasize that the new strategic weapons systems that have been created or are underway, are in essence new kinds of strategic weapons, and not undertakings of the Soviet Union times," he added. All that was mentioned in his address to the Federal Assembly - has been done in the past few years, Putin stressed. "This has been done by tens of scientific institutions, scientific bureaus and institutes. Thousands, exactly thousands of our specialists have been working on this for many years with a full devotion, calmly, modestly and without any narcissism," Putin added. "Advanced military development is always based on outstanding achievements that must and will in due time be used in the civil high-tech industry," he said. "These unique and complex weapons can only be successfully designed and produced by the state as it requires high-level fundamental science and education, a strong research base, technologies, industrial capacity and human resources," Putin noted. "You can see that Russia has all these resources. We will continue to build up and accumulate these capabilities in order to achieve large-scale goals that our country is facing in the economic and social fields," he said. "Russia’s long-term sustainable development will always be reliably protected," Putin added. "Each and every one of the new weapons systems is unique and important, but what is more important is that all this together provides experts from the Defense Ministry and the General Staff with an opportunity to create an advanced comprehensive national defense system, in which every newest military tool will have its place," the head of state said. "Along with operational strategic weapons, which we have been continuously improving, Russia is getting a defense system that will ensure its security in the long term," Putin concluded.